A new Alien Covenant production image has been released as filming on the upcoming Alien movie comes to a close this week. 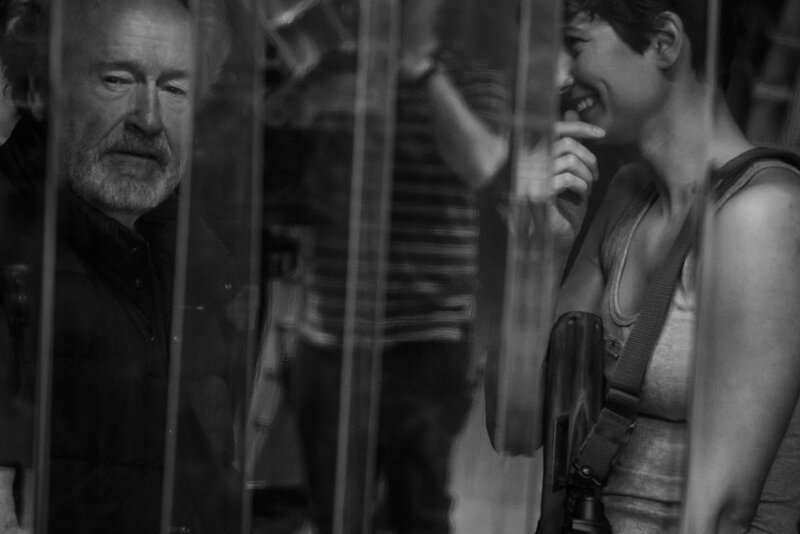 The official Alien social media accounts posted this black and white image of director Ridley Scott and actress Katherine Waterston joking around. The caption reads: “Filming has wrapped. The next phase begins. #AlienCovenant”. The next phase is a lengthy post-production process and hopefully the marketing will kick into gear in the coming months. We may even have a Alien Covenant teaser trailer before the year is out. As you can see, Waterston’s character looks very similar to heroine Ellen Ripley. This production image follows the very first one the filmmakers posted a couple of months ago showing Katherine Waterston’s character sitting in a corridor on the assumed Covenant spaceship. Thanks to Alien 3 for the news. Alien: Covenant Filming in New Zealand?